Be the first to share your favorite memory, photo or story of Kristi. This memorial page is dedicated for family, friends and future generations to celebrate the life of their loved one. 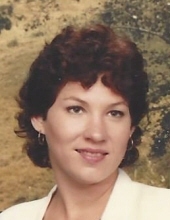 EURICH, Kristi Lynn - Age 65, of Flint, died Thursday August 30, 2018. Visitation will be held 2PM-3PM Sunday, September 2, 2018 at Sharp Funeral Home and Cremation Center, 6063 Fenton Road, Flint. Those desiring may make contributions to McLaren Hospice of Michigan. Kristi was born in Flint on April 16, 1953 the daughter of the late Leon John and Juanita May (Maglothin) Eurich. She married Joseph Richard Shukis on February 21, 1992 in San Francisco and he preceded her in death on February 14, 2016. Kristi had one year of college at U of M Flint and was a self employed cook for private individuals for many years. Surviving are: sister, Jeanne (Rick) Boettcher of Winder, GA; brother, John Michael and Peggy Sabatini of Flint; plus numerous nieces and nephews. She was also preceded in death by her brother Steven Marc. Tributes may be shared on the obituaries page of www.sharpfuneralhomes.com. To send flowers or a remembrance gift to the family of Kristi Lynn Eurich, please visit our Tribute Store. "Email Address" would like to share the life celebration of Kristi Lynn Eurich. Click on the "link" to go to share a favorite memory or leave a condolence message for the family.